Photo Note: This photo was taken in March, 2011 while I was on crutches and a few weeks after the earthquake. The garden was the only place I found peace in those days, so it seems a good fit here. When I was a kid I hated gardening. My mother asked me to help her in the garden, and I'm pretty certain I whined and was such a miserable companion that she finally found great relief in letting me just stay indoors to read or watch TV. It was too hot. It was boring. It was dirty. And tomato hornworms were just too gross for words. Gardening is now something I find I can't live without. 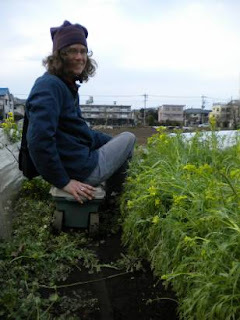 Our move to Tokyo in March of this year was only feasible in my mind because I had a chance to have a garden. (That first one fell through, but then another and even better opportunity presented itself.) I didn't even have a garden of my own until we moved into a farmhouse in Michigan more than five years ago. There, along an old fence, I dug out the sod in a strip about two or three feet wide and about ten feet long and planted my first tomatoes, beans, kale, swiss chard, basil, parsley, and beets. It wasn't long before nasturtiums and johnny-jump-ups, and a couple bush squash plants were added. The next year the garden jumped the fence - literally and figuratively - to become about four times larger. Popcorn, cardinal climber, morning glories, potatoes, cosmos, chives, and peas joined the green chorus. Morning found me in dew soaked slippers with a steaming coffee checking the progress of seedlings or just soaking in the thrill of seeing those plants. Before heading into the house after a day at work I'd walk over to the garden to see how the day had gone, and more than once a nice skirt received a swish of dirt from an irresistible urge to weed "just a little bit" before even greeting my husband. I found in gardening a chance to do something concrete. It put food on our table, in our freezer, on the pantry shelves, and made for some great gifts. Canning tomatoes, drying herbs, and whipping up batches of pesto for winter pasta remains satisfying work. And the task of eating them is work I tackle with relish. I found great beauty. Thick veined cabbage leaves are one of the most beautiful things I think I've ever seen. Cobs of homegrown popcorn glinting in the sun thrill me to the bone. My own eye for color and composition is still developing, but I confess I don't work too hard at that. I like the increasing madness of my garden as the season progresses. I made new friends. The praying mantis, the assortment of bees, the birds, and the occasional neighborhood cat are welcome visitors. Not to mention the instant bond that develops with a fellow gardener when we learn of each other's passion. There's nothing better than a good chat about growing vegetables. It's what bonded the Takashi's and I almost instantly despite a language barrier. It's in my blood. I've written about this before (not for publication), and I think about it more often than not. I come from a long line of farmers (who doesn't, really? ), and the joy I find in planting, weeding, harvesting, monitoring, eating from, composting, and viewing the garden (mine and others) courses through my veins. The rolling landscape of hay, corn, horses, wheat, and cows with woods, rivers, lakes, and kitchen gardens the same square footage as many homes in new developments is a part of my heritage of which I am most proud. As I tend my own small plot or work with the Takashi's to tend their fields, my mother and grandmothers and friends and family (here and gone) who've gardened and farmed before work beside me. The joy in that alone wheels me out to the garden and farm again and again. Gardening and farming presents a chance to explore my own history, the history of others, to find common ground through food and the growing of it. It presents an intellectual and creative challenge each and every day of the year. And an element of surprise in the volunteer nasturtium, the sneaky fresh potato crop. I could write about this for hours, years, and thousands of words, and still not quite hit it right. But when I see dirt still stuck under my fingernails while at my office (I only have so much patience with a nail brush) it reminds me of who I really am and what I love best. Inspired by the essay contest over at Gardens of the Wild Wild West. This is probably too long, but it was too much fun to stop. Keep rummaging through those old posts- I'm loving them!!! I love YOUR love of gardening-- I'm afraid I don't have the love for it, but I do so love watching and reading about others who love it. To me, I admire them- envy them- because I can see how fulfilled they are doing it--- its like when I watch someone knit...and I try it (as I'm doing now) and realize this is NOT in my veins...and I plant the seasonal plants, but as I do it...I know this is also not in my veins...:)...then I come and read of your exploits and I enjoy it tremendously!! Anjuli, I think I need to send you a jar of marmalade (at least!) in thanks for all your reading and commenting. It is really so nice, and your feedback is always great. Knitting?!? That's one of my other favorite things to do, but I have little talent for it. I'm not fast and I'm a little lazy about parts of it, so what I make always has multiple flaws. It just feels good to do something concrete with my hands sometimes. Keep at it! :) keep the marmalade for me- I just might be coming to visit Japan in 2012. If I do- I'll definitely meet up with you and you can pass it to me. Consider it done!! Looking forward to it.